The District of Columbia, like much of urban America, is facing a public healthcare crisis. Notwithstanding the considerable evidence indicating the disparities in health between residents of urban America and other Americans, there remains no proactive strategy for resolving these differences. The institutions and programs in place to address these healthcare concerns are scattershot and incomplete. Moreover, the lack of coordination and integration of these healthcare services leaves too many holes for the District's underserved and indigent to fall through. It is no longer acceptable to simply express regret regarding urban America's healthcare deficits. We must construct an architecture to aggressively confront and resolve this intolerable situation. The cornerstone of this integrated healthcare infrastructure must be a comprehensive Urban Healthcare Campus. The District of Columbia -- despite enormous financial expenditures -- has made little progress in constructing a successful healthcare infrastructure. Tragically, the District leads the nation in its failure to address certain very serious health crises. Several examples of this failing healthcare system within the District concern HIV/AIDS, Tuberculosis, infant mortality, substance abuse, and mental health. The District is at or near the top in national averages of occurrence for these problem areas. The District ranks first in the nation for annual cases of AIDS per 100,000 population. In the twelve-month period ending on June 30, 1998, the District had 178.3 annual AIDS cases per 100,000 population, or a total of 10,887 cases. In that same time, the United States as a whole had only 19.6 annual cases of AIDS per 100,000 population, or a total of 643,350 cases. The Center for Disease Control and Prevention (CDC) reports that the District is the metropolitan area with the fifth highest number of AIDS cases in the United States. As of December 31, 1999, the CDC reported 21,648 active cases of AIDS in the District. The District also comes in with the ninth most AIDS cases among states and territories as of this December 31, 1999 report. Equally disturbing as the AIDS rate in the District is the rate of Tuberculosis. The District ranks second nationally in number of annual Tuberculosis cases per 100,000 population, behind only Hawaii. In 1999 the District had 13.5 annual cases of Tuberculosis per 100,000 population. The United States in 1999 had an average of 6.4 annual cases of Tuberculosis per 100,000 population. Infant mortality is another alarming health problem in the District. Infant mortality is an indicator of numerous other problems including substance abuse, physical abuse, disease, high rates of teen pregnancy and a lack of accessible healthcare. In 1997 the infant mortality rate was 12.1 deaths per 1,000 live births, which is 70 percent higher than the national average of 7.1 deaths per 1,000 live births. The root of many of the Districts health problems can be traced back to substance abuse. In 1999, the Substance Abuse & Mental Health Services Administration (SAMHSA) reported that an estimated 7.6 percent of the District's population had used an illicit drug within the month of their survey, while 17.5 percent had participated in binge drinking of alcohol. It has been estimated that there are 70,000 District residents with an addiction problem. All of the above health issues create the most important and alarming health indicator in the District, life expectancy. Nationwide life expectancy has been going up. The same cannot be said for the District. Life expectancy for District men is 10 years below the national average and 5 years below for women. When these numbers are separated by race, they become even more alarming. For Black men in the District, life expectancy is now 56 years or less. This 56year life expectancy for Black men is lower than for any nation in this hemisphere except for Haiti. The numbers are alarming and something must be done to stop this trend. This proposal calls for the creation of a fully integrated medical campus on the grounds of DC General Hospital. Among other features, this proposal envisions a full service hospital, mental health facilities, comprehensive substance abuse treatment options, HIV/AIDS services, etc. Essentially, this proposal seeks to end the past District practice of "silo" style services where illnesses rather than people are treated. For too long, the lack of cooperation and coordination between various aspects of our healthcare infrastructure has impeded our ability to provide meaningful and successful healthcare. An integrated Urban Healthcare Campus, treating the many illnesses of our patients, should dramatically improve the quality and efficiency of our healthcare infrastructure. A. Creation Of A Federal/District Partnership That Is Focused On Specific Urban Healthcare Issues. As discussed throughout this proposal, urban healthcare providers are confronted with unique challenges. Rates of trauma, drug abuse, Tuberculosis, substance abuse, HIV/AIDS, and injury associated with violent crime are far greater among urban providers than non-urban. The Federal Government has not addressed the urban/non-urban healthcare divide. This proposal seeks a partnership between the District and the National Institutes of Health (NIH) in the completion and operation of the new Urban Healthcare Campus. A partnership with NIH will afford the District the opportunity to utilize NIH's expertise in both healthcare management and research. 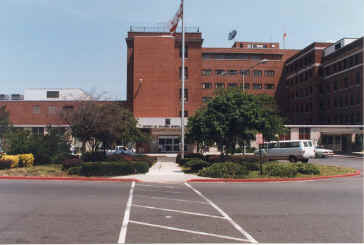 In exchange, the new Urban Healthcare Campus can offer NIH a setting to continue their research and training mission, especially in the area of urban healthcare. National Institute of Diabetes and Digestive and Kidney Diseases (NIDDK) conducts and supports basic and applied research and provides leadership for a national program in diabetes, endocrinology, and metabolic diseases; digestive diseases and nutrition; and kidney, urologic, and hematologic diseases. Several of these diseases are among the leading causes of disability and death; all seriously affect the quality of life of those who have them. National Institute of Allergy and Infectious Diseases (NIAID) research strives to understand, treat, and ultimately prevent the myriad infectious, immunologic, and allergic diseases that threaten millions of human lives. National Institute on Aging (NIA) leads a national program of research on the biomedical, social, and behavioral aspects of the aging process; the prevention of age-related diseases and disabilities; and the promotion of a better quality of life for all older Americans. National Institute of Mental Health (NIMH) provides national leadership dedicated to understanding, treating, and preventing mental illnesses through basic research on the brain and behavior, and through clinical, epidemiological, and services research. National Institute on Drug Abuse (NIDA) leads the nation in bringing the power of science to bear on drug abuse and addiction through support and conduct of research across a broad range of disciplines and rapid and effective dissemination of results of that research to improve drug abuse and addiction prevention, treatment, and policy. National Institute on Alcohol Abuse and Alcoholism (NIAAA) conducts research focused on improving the treatment and prevention of alcoholism and alcohol-related problems to reduce the enormous health, social, and economic consequences of this disease. National Institute of Child Health and Human Development (NICHD) research on fertility, pregnancy, growth, development, and medical rehabilitation strives to ensure that every child is born healthy and wanted and grows up free from disease and disability. National Cancer Institute (NCI) leads a national effort to reduce the burden of cancer morbidity and mortality and ultimately to prevent the disease. Through basic and clinical biomedical research and training, NCI conducts and supports programs to understand the causes of cancer; prevent, detect, diagnose, treat, and control cancer; and disseminate information to the practitioner, patient, and public. National Heart, Lung, and Blood Institute (NHLBI) provides leadership for a national research program in diseases of the heart, blood vessels, lungs, and blood and in transfusion medicine through support of innovative basic, clinical, and population-based and health education research. Many of the problems associated with the failure of the Public Benefit Corporation (PBC) concern its management structure, as well as its relationship with the District government. The inefficiencies of the District Government were transferred to the PBC: poor information management services; inadequate capital facility planning; cumbersome contracting and procurement; expensive labor contracts; etc. To shed these inefficient practices and lack of expertise, this proposal seeks a private management -structure for the new Urban Healthcare Campus. This proposal leaves unaddressed whether that private management should be "for-profit" or "not for-profit." Some examples of what could occur include a lease agreement, a joint operating agreement, or a joint venture. One possible solution would be to lease the hospital, its clinics and equipment to a management firm. This approach was taken in Austin, Texas, which leased its public hospital to Seton Health Care Network for 30-years. All indigents still have access, but the subsidy for indigent care is capped at $17,000,000.00 annually. A second possible solution would be for the District to turn over the operation of the hospital to the private sector, but retain a measure of the influence by appointing a portion of the board members to the joint venture. An example of this working occurred in Oklahoma where the state transferred the operation of its state teaching hospitals to Columbia/HCA Healthcare Corporation under a 50-year contract. The state of Oklahoma and Columbia/HCA Healthcare will each appoint five directors to the board of directors of the newly formed hospital authority. A final possible solution would be for the District Government to sell a portion of DC General's assets for cash, retaining power to appoint a portion of the board members. An example of this is what occurred with California's Sequoia Healthcare District. In 1997, it netted $30,000,000.00 in cash by affiliating with Catholic Healthcare West. Over the next six years, approximately $330.6 million in capital ($192 million in tobacco dollars and nearly $138.6 million in unexpended capital dollars identified in the Departments of Health and Human Services, the Public benefits Corporation, and the Commission of Mental Health) will be available for this proposed project. Please see attached Memorandum from Arte Blitzstein, the Council's Budget Officer and Clarence Campbell, Senior Budget Analyst. The development and construction of new healthcare facilities is not as expensive as one might imagine. The current 371 bed George Washington University Hospital construction project is estimated to cost $96,000,000.00. This project is to include an expanded emergency room and larger operating rooms capable of accommodating today's advanced surgical equipment. The majority of the patient rooms will be private, allowing appropriate space for patients and their families as well as physicians and staff. A sampling of other ongoing hospital construction projects can help illustrate that the notion of constructing a new Urban Healthcare Campus on the grounds of DC General is feasible and affordable. In Statesboro, Georgia the construction of the new East Georgia Regional Medical Center is expected to cost $53,000,000.00. This facility is a 150-bed hospital that includes a women's pavilion, which will house 21 beds for postpartum and gynecological medicine including mammograms, ultrasounds, general X-ray and lab equipment and prenatal and nursery care. The space will also provide space for specialties including cardiology, neurology and gastroenterology. In Suffolk, Virginia they are building the new Obici Hospital, a 138-bed hospital, at a projected cost of $85,000,000.00. In Marion, Illinois they are building a 92-bed hospital that has not yet been named at a projected cost of $48,000,000.00. New Island Hospital in Bethpage, New York is undergoing a capital improvement project that will include 36 new medical beds, a new emergency department, and 7 additional operating rooms for an estimated $48,000,000.00. The following hospitals are going through an expansion and renovation process to improve their healthcare facilities. St. John's Hospital in Springfield, Illinois is finishing a project that encompasses 40,000 square feet at a cost $10,700,000.00. Allegan General Hospital in Allegan, Michigan is going through a similar project at a cost of $8,500,000.00. A 445,500 square foot project at Overlake Hospital Medical Center in Bellevue, Washington is expected to cost $56,000,000.00. It is clear from the above figures that we have the capital to proceed with the construction of a new Urban Healthcare Campus on the grounds of DC General Hospital. With the utilization of a modern facility we are certain to save millions of dollars in operating cost each year. A new healthcare campus can be constructed in a manner that allows for the most efficient and best medical service possible saving not only dollars, but also lives. The District spends per capita an extraordinary amount on providing healthcare services to its residents. The inefficiencies and lack of quality certainly contributes to these enormous costs. While this proposal has not calculated the additional costs associated with operating an integrated campus, intuitively there is no reason to believe that integrated care is any more expensive to provide than non-integrated. Successfully treating the whole person for all of their illnesses is another way the District will save money at the new Urban Healthcare Campus. Eliminating return visits will lead to significant cost savings. For example, our failure to treat an individual for both their depression and substance abuse means that the untreated illness continues and contributes toward a relapse of the treated problem. By completing the stated goal of improving the leadership and management within the District's healthcare infrastructure, cost savings and additional revenues will certainly be generated. For example, an aggressive and experienced management team will have the ability to improve the hospitals system of billing and collecting. An efficient management team can also insure that all hospital services and programs are licensed and properly registered. This is important because a number of services and programs are not currently receiving the revenue they could be if they were properly licensed or registered. In addition, the proposed Urban Healthcare Campus can generate additional revenue for the new campus by serving more patients. A quality healthcare campus, complete with the prestige of NIH, would certainly attract more patients. Additionally, the successful marketing of the new Urban Healthcare Campus can raise its revenues. In the past, the PBC has failed to market itself to patients that do not fall within their local service boundaries. The new Urban Healthcare Campus must reach out to the regions entire population and proclaim it is ready and willing to successfully serve them. The combination of a first class healthcare facility and more marketing is likely to add new clients to Urban Healthcare Campus' daily patient list, therefore increasing revenue. Among other functions, this group would be responsible for surveying recently or newly constructed healthcare facilities. Because time is a factor, there is an advantage in building upon existing models. In the end, this group is responsible for developing the plan for the physical infrastructure of the new campus. Along with representatives from NIH, representatives from our existing healthcare infrastructure (both public and private) are needed to construct this comprehensive medical infrastructure. The status of the existing collective bargaining agreements remains a significant issue. This Group should focus on minimizing these costs while at the same time working closely with labor to retain as many existing employees as possible. This Group should focus on developing a comprehensive and aggressive management strategy that will assure financial stability for the new Campus in the years to come. Among other task to be completed is a survey of possible forms of management as well as revenue sources. A successful healthcare infrastructure requires planning, commitment and accountability. The model proposed contains all of these elements. This model, if properly implemented will permit the District to lead the nation in common sense healthcare policy for its underserved residents.